built for accumulation & income! #1 Bestseller, Retirement You Can’t Outlive. Dennis M. Postema is a successful entrepreneur, best-selling author, speaker, and registered financial consultant who has dedicated his career to solving the insurance and retirement issues faced by his clients. After working as a captive agent for a large insurance carrier, he realized he could offer his clients more options, better products and a more secure future if he went independent—so at age 23, he did. - Ron Iverson, President and Executive Director National Association of Medicare Supplement Advisors, Inc.
Tell me more about this FIA. 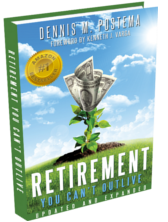 Tell me how to get 15 or more FREE copies of "Retirement You Can’t Outlive". I’m a PMG agent. What’s my discount code?